How did first years obtain wands during Harry's 7th year? In Harry Potter and the Half-Blood Prince, Ollivander is missing and his shop is closed. Since Ollivander's is closed, how are new first years entering Hogwarts acquiring wands? Book 7 does show some measure of wand legislation under the new regime. Does the Ministry have possession of all of Ollivander's wands and only release one to first years/replacements after verification of blood status, or do the Death Eaters have them all or a cache of some (see the Bellatrix question linked above)? When they first get the news that Ollivander is kidnapped by the Death Eaters, Ginny asks how people will get their wands. ‘The wand-maker?’ said Ginny, looking startled. The first years at Hogwarts under the Dark Lord's control could have gotten wands from any of them. The Dark Lord wouldn't have considered it important to make sure first years had the best quality wands. 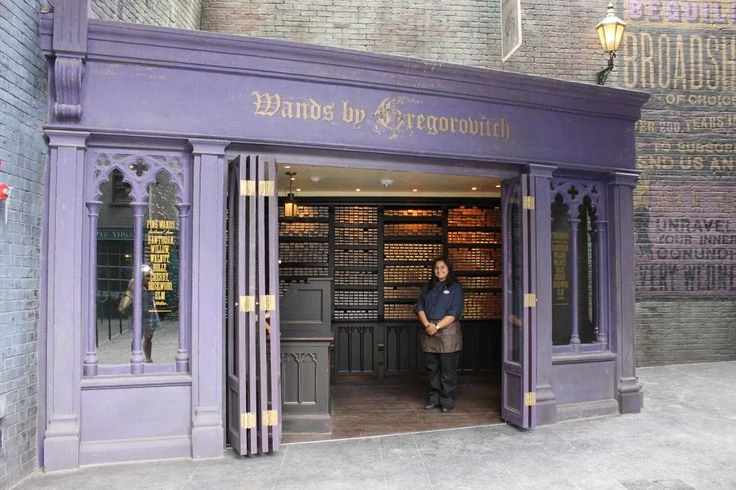 Not the highest level of canon, but at the Wizarding World of Harry Potter exhibition you can visit a rival wand-shop further down Diagon Alley, Wands by Gregorovitch. Apparently their key selling point is that rather than going through a bunch of wand-choosing-mumbo-jumbo with that old buffer Ollivander, you can just walk in and buy the wand of your own choosing. Even though Olivander's Shop is an important part of the Harry Potter story, it's not reasonable to assume all wands were distributed through that shop alone. There would be other shops around the world, and as with the Weasley family, there would be hand-me-downs. And of course there must be some number of other wizards around the world who actually craft the wands in the first place. What do you think the Ministry of Magic under Voldemort's control was doing with the wands of Muggle-borns that were sentenced to Azkaban? The Commission punished anyone who could not prove to have wizarding heritage for this alleged action, sentencing them to Azkaban. ... or were punished less severly? Furthermore, their "interviews" were shams, fully intent on sending innocent Muggle-borns to Azkaban, or stripping them of their wands and jobs, leaving them impoverished. As discussed at How do the Azkaban escapees get their wands back? Wands don't just vanish when one is sentenced to Azkaban. And since the muggle-borns were unable to keep their wands, there is an ever-growing inventory of potentially available wands for new First Years. "Hmm," said Mr. Olivander, "this is a Gregorovitch creation, unless I'm much mistaken? A fine wand-maker, though the styling is never quite what I. . . however. ."
Hagrid says something along the lines of "Olivander's - no place better" which hints at their being more than one shop. How do the Azkaban escapees get their wands back? Whose wand did Bellatrix use at the Battle of Hogwarts? Why do wands work for a wizard when disarmed/borrowed, but not while purchasing? Did Draco's wand choose him, or was it chosen for him?